Ever since our inception in the late 1990's we have been warning consumers about the dangers of trading in your existing used car when you head out to buy a new car. Unfortunately most car shoppers make very foolish and painful mistakes, among them trading in their existing car when buying a new car, but even worse, trading in a car that they still owe money on. Let me reiterate again, that our official position here at CarBuyingTips.com is that you should never trade in a car you owe money on, so what is supposed to happen is you are not supposed to trade in a car with an existing loan balance, it was a trick question. That being said, in an ideal world your car salesperson should determine from the lender you obtained your car loan through what the current 10-day payoff amount is so that they can pay off your loan and close it out. Also keep in mind that most car buyers are upside down on their loan, meaning they owe more to the bank than the trade-in value that the car dealer is giving you. In this case, you are responsible for that gap in value, and this amount usually gets added onto your new car loan. Car dealers don't go out of their way to inform you of this, because most people would have second thoughts about a car payment that represents 2 cars, when they thought they are only buying one car. Most car shoppers erroneously think that when they trade in a car, it is gone forever, along with all the payments and obligations. Any amount you still owe on the previous car is always padded into the payments of the next car. which often starts you off upside down on your new car loan right out of the gate. You need to avoid this situation at all costs. Normally when you call any lender for your payoff amount, the payoff figure they give you is good for 10 days, otherwise interest starts to accrue and they have to recalculate the amount and give you a new payoff figure which would be good for 10 days from your newer request date. This is the most crucial part of this entire transaction. The car dealer must pay off your trade-in vehicle within 10 days and they must pay it off before your next monthly car loan payment due date. If they fail to do this, then in the lender's eyes, you are now late with your payment, and you will get slapped with a late monthly payment fee, they don't care you sold your car, you still have an unpaid loan. We have heard over the years from car buyers who traded in their car with an outstanding loan balance to buy a new car, and the dealer was supposed to pay off the car loan but did not. What happens next is the buyer is living a blissful life with their new car thinking the old car is out of their life forever, when out of the blue they start getting menacing letters and phone calls from the lender who is holding the note on their previous car. The lender is complaining that these car buyers are now a month late and they have to pay penalties and late fees. This ends up slapping many people upside the face, taking them completely by surprise, because, as they all tell me, "I no longer own that car, the dealer does! I sold it to them over a month ago." Unknown to you, while you were enjoying your new car, the interest was still accruing on your old car loan because the dealer had not paid off the loan like you thought. This is where everyone makes the mistake of thinking that they signed paperwork so it must be a done deal. They could not be more wrong, and the meter is still running. The big error in thinking among car buyers is that they think that just because they traded in their old car and no longer own the car, that there is no more responsibility to that car. The problem is like the old saying goes, no job is finished until the paperwork is done. In this case, while you might no longer own the car, you do indeed still owe that loan until it is paid off in full. You can argue all you want with the bank that you sold your car to the car dealer. The bank could care less, because they have a contract for the loan to be paid back by you, that is written between the bank and you, no the car dealer. Typically the car dealer does not take your place as the borrower; they usually take your place as the owner of the car. Since they don't want to take your place as the borrower, and if they are legit, they payoff the loan on your trade-in which should be less than your trade-in value. But again, the bank only recognizes you as their customer, as the person responsible for paying back the loan until it is paid off 100% and the lien is satisfied. As far as the lender is concerned, the contract is between the bank and you, not between the bank and the car dealer. We've heard from people over the years who had their credit ruined over this because the lender will place a black mark on your credit report for being 30, 60, or 90 days late, on top of all the late fees and interest they will hit you up for. It's up to you to make sure the loan got paid off by the dealer days after the deal is completed. You need to keep calling your lender to confirm when and if the loan was paid off and be certain no other amounts are owed. This scenario described here happens more often than you think, and we have heard complaints about this over the years from many car buyers. This is why we have been warning you for many years never to trade in your car if you owe money on it, because the risk is too high that the car dealer will not pay off your loan, and you will be stuck paying extra interest, you can have your credit report trashed, and you will suffer emotionally. Is this legal? What can be done to force the dealer to pay? There is not much you can do here, because there are no laws forcing the dealer to pay your car loan off. There was nothing in writing on the dealer's paperwork stating they would pay off your car loan, and you failed to force them to give you anything in writing. All you can do is file an online complaint with the Better Business Bureau at BBB.com, or your state's attorney general web site, and also leave a public review of this car dealer's dirty deeds on the Ripoff Report web site. This way anyone doing a search on the car dealer will see your BBB and Ripoff Report complaints. The Better Business Bureau, and Attorney General's office are entities which managers of that car dealership have to listen to, even if the salesperson or finance person are ignoring your phone calls. If they don't answer Better Business Bureau complaints, their grade drops. You need a preemptive strike here, you need to force the dealer to put into writing exactly how much they are giving you for your trade, and that that they will pay off your car loan in full in 10 days or they will have to pay 100% of all expenses arising out of failing to do so. If the dealer refuses to give you anything in writing, then leave, or your life will surely be pure agony in the very near future. It’s too bad that we don't have any laws on the books forcing dealers into a common form of disclosure that itemizes the trade in amount, and what is owed on the trade in, and who is paying what for the loan payoff if there is one. You might also go to where the signatures are located on your paperwork, and have the dealer write in "Dealer agrees to pay off trade-in car loan in full within 10 days." Any car dealership refusing to honor this minor request of yours by adding that one tiny little phrase to the paperwork is unethical because they don't want to protect your rights, while giving them carte blanche to commit an array of scams against you, and thus you should leave immediately, this is a deal killer, and the deal is over at this point. If the dealer tells you not to worry, it's already written into the fine print that they will pay off your car loan, have them show you the exact sentence, otherwise they are lying. If they are smart enough to tell you it's already in the contract, then they are smart enough to show you where it is. This is where you need to be very alert during your transaction, because you want the dealer to itemize on your paperwork exactly how much they are giving you for your trade-in so there is never any confusion over what you are getting. 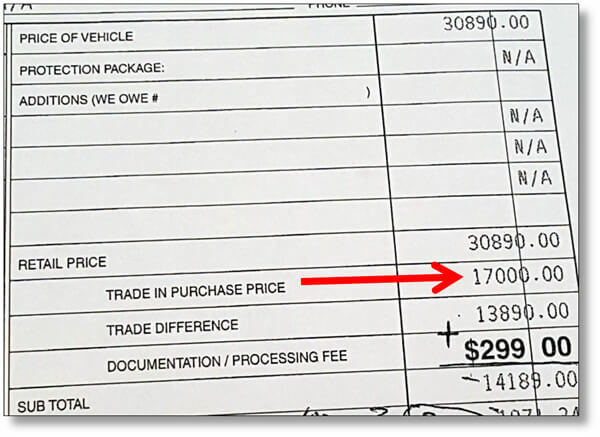 These 2 photos below show examples of actual new car paperwork that reveal where the dealer indicated how much they are giving the buyer for their traded in vehicle. This is where the rubber hits the road because if they promise to give you $8670 for your trade-in, then it better be itemized there on the paperwork at that amount with no games. What should you do with a trade-in that you still owe money on? If you still owe money on the car loan for your existing used car, we recommend you try to pay off the loan yourself, this way you get the title in a week, you no longer have to worry about who's going to pay off the loan and now you have a car that is easier to sell to more potential buyers, both private buyers and car dealers, because many used car buyers won't buy a vehicle from you if it has a loan balance, or unless you have the title. This is a much better financial and logistical position for you to be in than taking a chance and hoping the dealer pays off your auto loan in time, because now you no longer have to trade in your car; you can just sell it privately first, and use the higher amount of proceeds you will receive as a down payment for your new car. Another benefit you get by paying off your existing car loan first is you are bypassing the car dealer trying to low ball your trade-in. Remember you can potentially make $3,000 to $6,000 more selling your used car privately, because dealers have to offer you way less than Kelly Blue Book used car market value for your car, so that they can recondition it and offer it for sale at a profit. What If you are upside down on your car loan and can't pay it off? 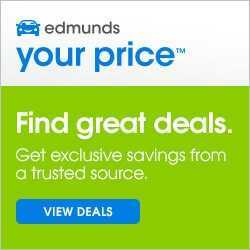 If you are upside down on your current car loan, and believe me, many of our CarBuyingTipos.com site visitors tell us they are under water by thousands of dollars, you don't have enough money to pay off your current car loan, what then should you do? You're not going to like my advice here on this scenario. The problem is you got yourself in deep and created a worst case financial scenario, a massive wake of damage, so our best advice for you is to ride out the storm, and keep the car you are upside down on and try to get back ahead of the curve by sending in extra principle payments whenever you can until you get right side up on the loan again. The problem with most car buyers is foolish lack of planning, and many people make the mistake of putting no money down when we recommend 20% down, and violating our 48 month maximum loan guideline, and going with 84 months instead. All this leads up to paying much more money over time in interest, as well as becoming upside down on your car loan the minute you drive off the lot. Avoid this used car loan balance trade-in scenario altogether by getting a shorter car loan like 48 months. This way if you decide to trade in your current vehicle in 5 years, your car loan will be paid off already. It really is that simple, you have to be smart and try to think ahead 5 years to see what obstacles to avoid. Warn all your friends about this, and don't let this scenario happen to you.